IAST offers the most superior experience of learning for the most sophisticated industry in the world. The course takes through exclusively designed exercises like wine matching, international cuisine appreciation, bartending showmanship and more to prepare students for the multifaceted industry. The rigor of the programme puts the student on his toes from morning to evening engaged in several curricular, co-curricular and extra curricular activities that constantly invigorate their minds. The advance curriculum developed around “Accelerated experiential Andragogy” prepares the student to overcome obstacles even beyond his professional life. Institution focuses on creating an environment apt for learning rather than imparting just classroom lessons. The students gain their knowledge and skill in time through actual experience attained in strategically designed activities whose learning lasts forever. Evaluation is an important part of a learning process. IAST has diverse means of assessing and evaluating a student’s knowledge and understanding of concepts. Examinations, projects, assignments and grading systems are used as parameters to ascertain the level of understanding of the students in various concepts. Examinations are held every year with written as well as practical evaluations by Andhra University. Soft Skills Training is given to students to empower them with effective communication skills and strategies to help them become confident in expressing their ideas, views and opinions without any inhibitions. All round Personality Development programmes and workshops are conducted for students periodically to enable them to harness their latent talents and skills that will in turn nurture their professional expertise. 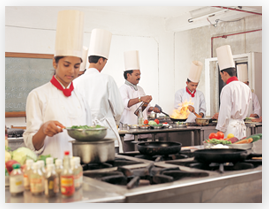 Rigorous practical sessions in core subjects of hospitality namely Front office, food production, F&B and housekeeping help the students apply and test their theoretical knowledge of the roles and functions in the hospitality industry practically. The IAST students need to undergo a six months industrial training in their second year to get a practical exposure of the hospitality industry. The students are expected to work in all the core functions such as housekeeping, food and beverage, front office and reception respectively. The students are selected for industrial training into various hotels, after initial screening of resumes by the hoteliers followed by a telephonic interview by the HR, or training managers of the hotels. Also, depending on the HR policy followed by individual hoteliers, students may have to go through a personal interview process for industrial training placements. However, some properties may not require this formality. The IAST students are required to submit an internship project in their third year curriculum as required by University. Students can chose to do the project in a hotel of their choice in any of the core subjects.